Leaf butterfly: caught in the net! When I first came across this large spider, I wondered what it was doing with a piece of old leaf. 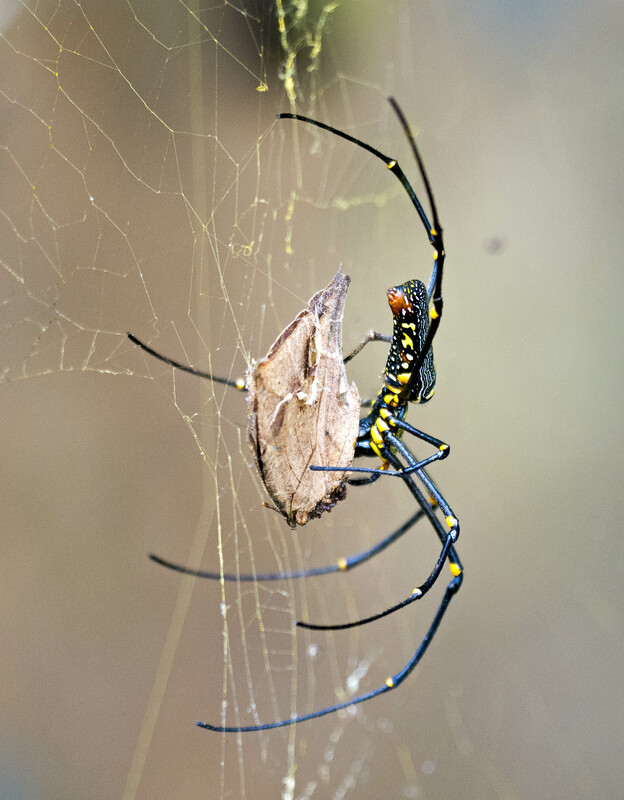 Large Nephila spiders like this produce large asymmetric orb webs on which they sit, waiting for prey items to blunder into them. Amazingly, they construct these webs afresh every day, having consumed the old one to conserve the proteins in the silk. 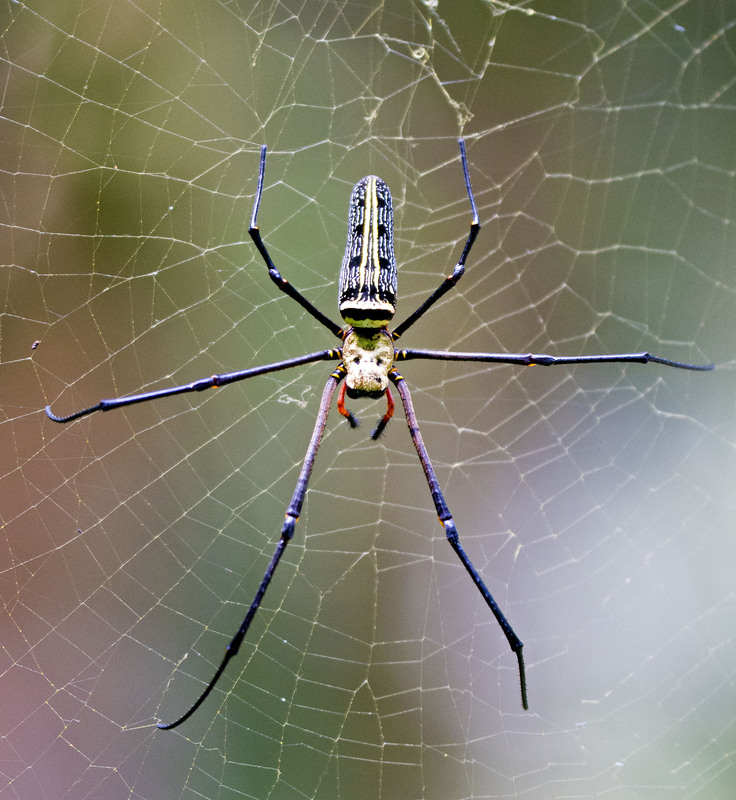 This one is the Giant wood spider (Nephila maculata) which is quite common in Thailand. Here is one seen from the top (dorsal) side (below). 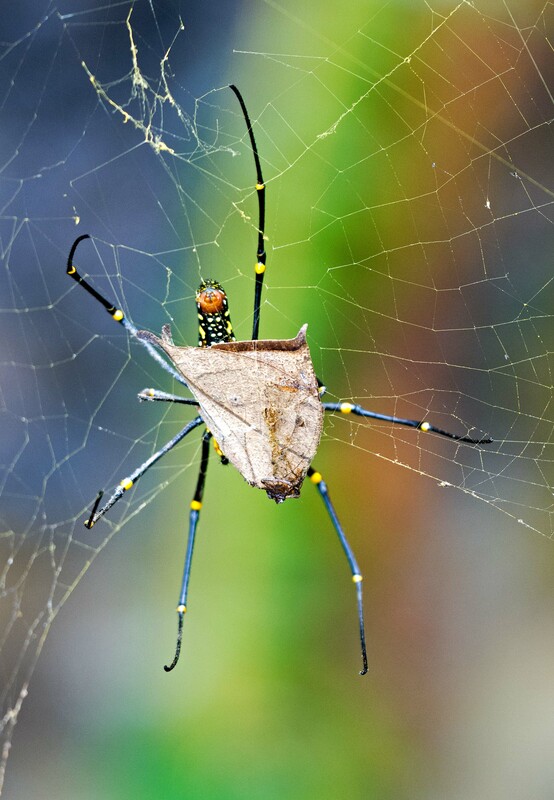 They are also called Golden orb web spiders. 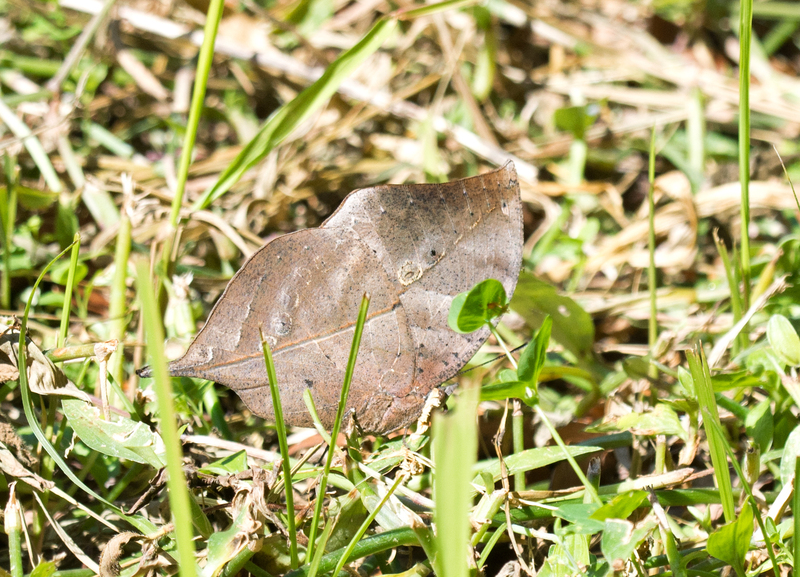 It was only after I had a good look at the photographs I had taken of the one with a leaf, that I realised that it was not a leaf, but a leaf mimicking butterfly. If you zoom in, you can still see the scales and some of the patterns on the wings of the leaf butterfly. 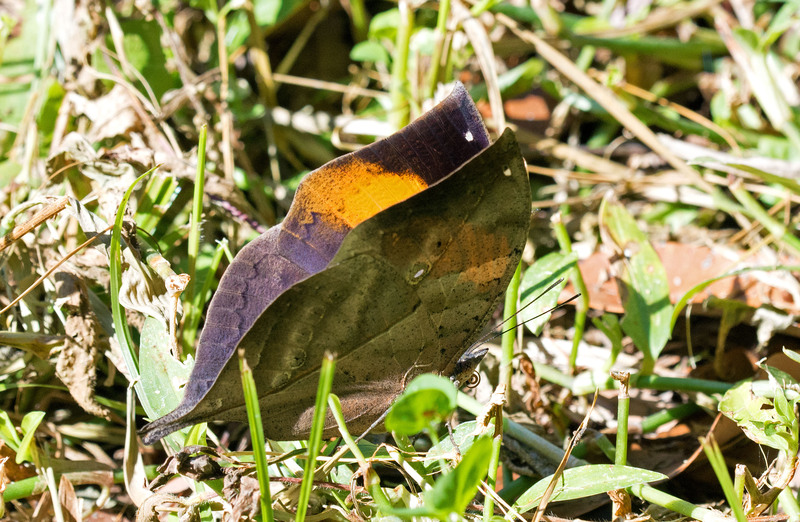 There are a number of these Leaf or Oakleaf butterflies in northern Thailand, where all of these photographs were taken, but the one which is quite common, is the Indian Leaf butterfly (Kallima inachus simamensis). I had come across one, and taken a few photographs, in the same area. They look rather different on the upperside! This one was a female. The males have a beautiful blue iridescence on their dorsal wing surfaces. 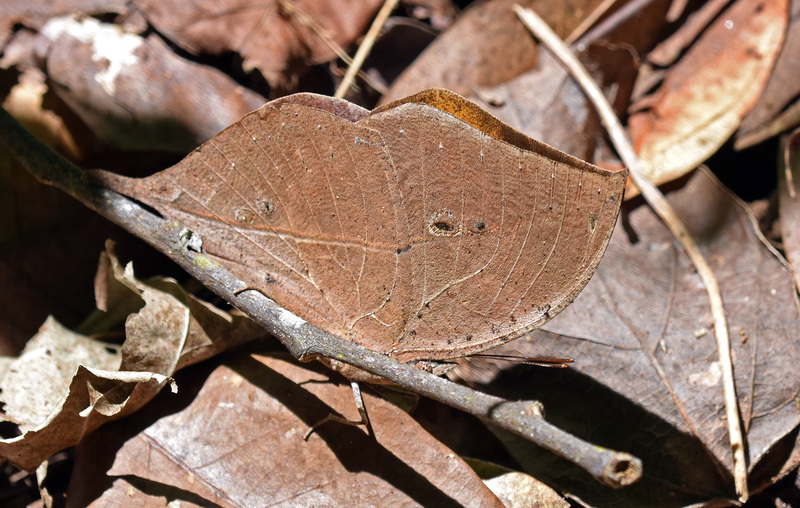 When they are resting among dry leaves, their camouflage is phenomenally good and they can be very difficult to spot! Anyway, the poor creature I came across in the spider’s web was almost certainly dead and had probably been sucked dry by the spider. It is just possible to see the tiny head and antennae of the butterfly in this highly magnified (i.e. highly cropped) shot, at the bottom of the photograph. 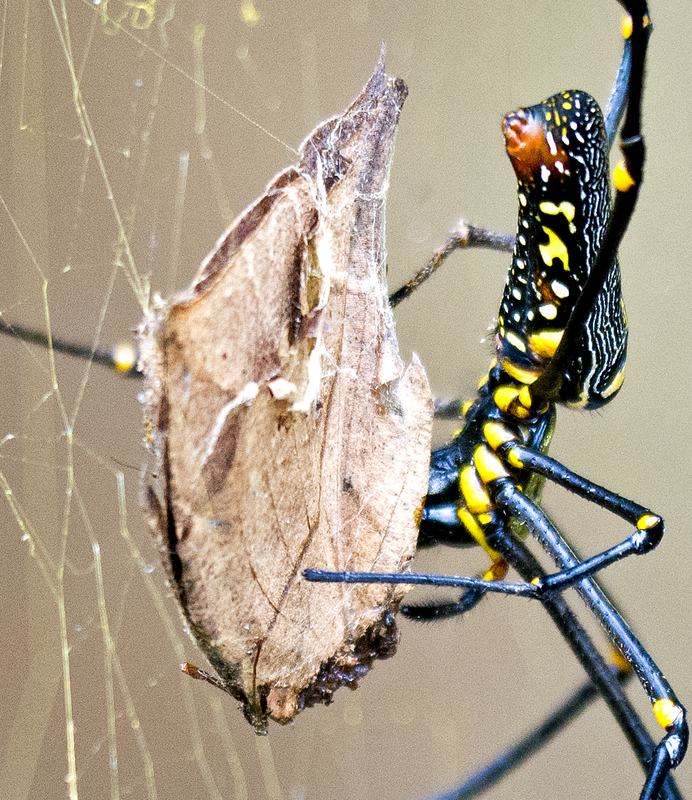 It is often said that one of the advantages of butterfly scales is that they detach easily and hence a butterfly might be able to escape from a sticky spider’s web by shedding some scales. This was clearly not the case in this situation and perhaps it illustrates how random some events are in nature. Did it get caught because it was slightly less better at spotting spiders web’s than its fellow butterflies, or was it just bad luck? Ray Cannon's nature notes Leaf butterfly: caught in the net!